Editor’s note: This is a guest post by Shane P. Singh, Assistant Professor of International Affairs at the University of Georgia, and Ryan E. Carlin, Associate Professor of Political Science at Georgia State University. Their article, “Happy Medium, Happy Citizens: Presidential Power and Democratic Regime Support,” is forthcoming at Political Research Quarterly. The presidential model of democracy is famously associated with democratic instability, as presidents are prone to usurping power beyond their mandates and clashing with the legislature, which is elected separately and can also claim to speak for the people. Nevertheless, newly (re-)emerged democracies in Latin America have chosen to maintain presidentialism but to reform its institutional framework in order to improve its flexibility and stability. This broad institutional experimentation begs the question: are certain models of presidentialism more likely to produce consolidated democracy? Democratic survival depends, in part, on public legitimacy, especially in countries prone to transitions away from democracy. In an article forthcoming in Political Research Quarterly, we reason that, within presidential systems, executive powers are associated with attitudes toward democracy. On the one hand, voters expect a degree of control over presidents, and a president that supersedes his or her mandate could spur disillusionment with the principles and performance of democratic regimes. On the other hand, an enfeebled president who lacks power could end up in perpetual conflict with the legislature, leading voters to become unhappy with policy immobilism and, ultimately, a deficit in representation. Thus, from a citizen’s perspective, the sweet spot should lie in the middle. Presidents who are either very weak or very strong will foster discouragement with democracy. But presidents who enjoy a happy medium of power, and thus must engage in some give and take with the legislature, will cultivate public support for democratic regimes. To test our expectations, we gather surveys spanning 1995-2005 from 18 Latin American countries, all with presidential models of democracy. Our dataset includes over 100,000 individuals, each of which was asked a.) whether they believe democracy is the best form of government and b.) whether they are satisfied with the way democracy works in their country. We also gathered three measures of presidential power: an index of the legislative powers afforded to the president by the constitution, a measure of the degree to which the president is constrained by the legislature, and a measure of the president’s realized legislative success, or “box score,” calculated as the percentage of bills initiated by the president that were approved by the legislature. As expected, we find that each measure is associated with attitudes toward democracy in a curvilinear fashion. That is, as presidential power and prerogative initially rise, individuals become more positive toward democracy, but at a certain point, further increases in presidential strength harm attitudes toward democracy. Our findings are illustrated in the figure, which makes it clear that each index of presidential power has an inverse-U shaped relationship with democratic support. 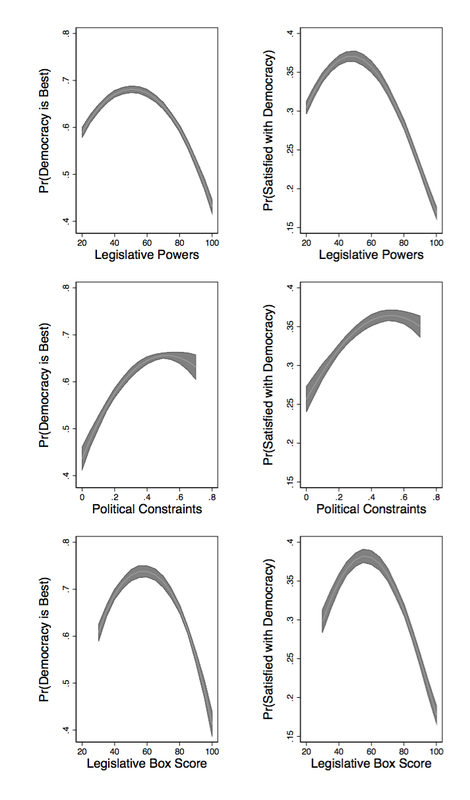 As an example, the bottom-right panel depicts the relationship between legislative success and the probability that a citizen is “very” or “fairly” satisfied with democracy. Consider a president whose passage rate is just 33 percent, like Colombian president Ernesto Samper in 1996. Starting from this low success rate, a standard deviation increase is associated with about a 7-percentage point increase in the likelihood that a citizen is satisfied with democracy. Citizens value presidents who are not completely ineffectual. Compare this to a president with twice the passage rate (66 percent), such as Honduran president Carlos Roberto Reina in 1996. Starting from this middling success rate, a standard deviation increase is associated with about a 10-percentage point decrease in the likelihood of a respondent expressing satisfaction with democracy. Citizens also value presidents who are not completely dominant. Interestingly, this curvilinear relationship is not conditional on presidential performance or trust in the president. In other words, citizens do not desire very strong powers for presidents who preside over booming economies, and even citizens who fully trust the president become less positive toward democracy when he or she wields vast authority. This speaks highly of Latin American citizens’ “democratic credentials,” in the sense that even those who might stand to gain from an unconstrained president prefer a happy medium of power. While presidentialism, as compared to parliamentary models of democracy, may harm democratic stability, not all forms of presidentialism are created equal. In fact, we show that presidential democracies are most successful—at least in terms of fomenting regime-supporting attitudes in the public—when the president’s powers are neither too weak nor too strong. Of course, the idea that a balance of power is good for democracy is not new. As James Madison famously wrote, “Ambition must be made to counteract ambition.” Latin American citizens seem to agree. This entry was posted in Institutions, Political Science, Quantitative Research by K. Chad Clay. Bookmark the permalink.